Valentines Day is coming, and you know what that means! The search for the perfect card that shows your love, devotion, and admiration! It's a lot of pressure, I know. So, you're at the store and you've opened and read every card, and of course nothing! These cards have no emotion, no character, ugh! Well now what do you do? 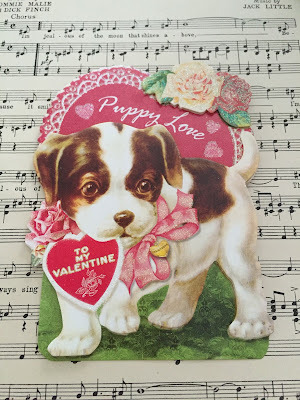 I say go to an antiques store, and look for antique Valentines Day cards. Now these cards have substance, they have adorable graphics, the sweetest poems, and charm. Also, while you are there, look for antique sheet music. Find song books that have valentine related words in the song titles. Words like, love, heart, and romance. Exciting isn't it? A truly unique token of your affection will be given to your sweetheart. 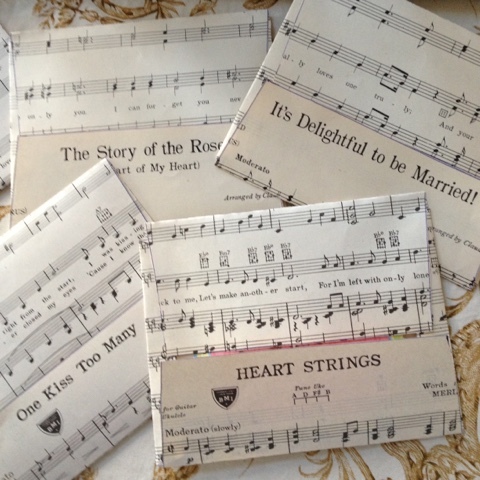 The next step is to make the envelope out of the music sheets. Go online and print out an envelope template. I found mine at Chia's Rubber Stamp Art. Look for a template that will fit your size card. 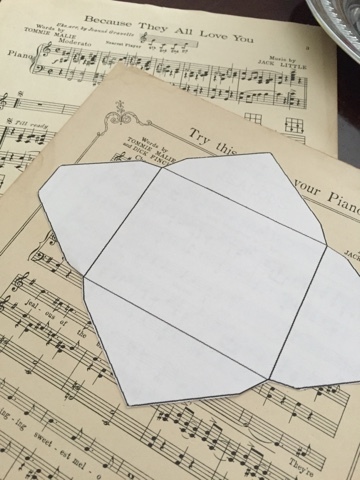 Cut out the template and lay it over the part of the sheet music that you want shown on your card. Cut along the template, fold in one flap at a time, while securing with double sided tape or glue. Slide your sweetheart's card inside, seal with a kiss, and your are ready for Valentine's Day! Isn't this bath bomb pretty? I love how the cinnamon and sugar sparkle! This was my first attempt at making a bath bomb, and you know, it was super easy. If you purchase bath bombs, you know how expensive a habit it is. Making your own will save you a ton of money, plus you can customize your bath bomb to your taste. Also, these are perfect for gifts; you know Valentine's Day is approaching! If you just set-aside just 1 hour, you can make customized bath bombs for all of your family and friends. 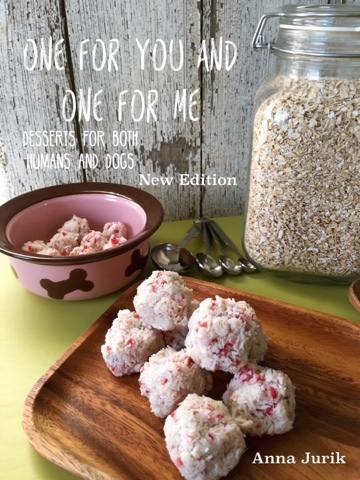 This recipe is from the Winter 2015 Chickpea Magazine. The original recipe called for canola oil, I used olive oil, but you can use any oil you prefer. Coconut and almond oil would also be excellent choices. 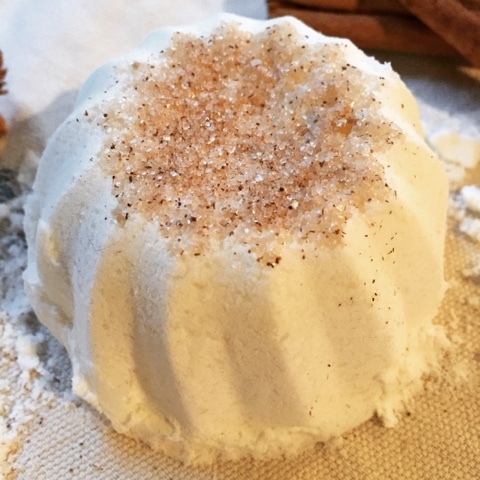 I added the cinnamon and sugar topping to mine, and scented the bath bomb with cinnamon essential oil. The mold I used was a vintage baking pan. 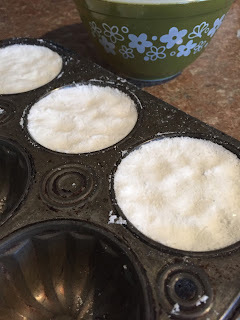 You can use also use molds that are solely made for making bath bombs. If you want to add dried herbs or flowers to the tops, add those to the mold first, then fill with the bath bomb mixture. I tripled this recipe, which made 3 medium sized bath bombs. Mix together the sugar and cinnamon, and sprinkle into your mold(s) so it covers the entire bottom. Set-aside. In a medium sized bowl, mix together the baking soda, corn starch, epsom salts, and citric acid. Set-aside. In a small bowl, whisk together the olive oil and essential oil. Add the wet mixture into the dry mixture. Stir mixture together until it resembles wet sand. You can add additional oil if needed to get the right consistency. Firmly pack the mixture into each mold(s). Let the bath bombs dry for 24 hours before gently removing from the mold(s). If the bath bomb it still a little damp when removed, let air dry for a bit. This week's Great British Baking Show transformation is actually a recipe from one of the bakers. 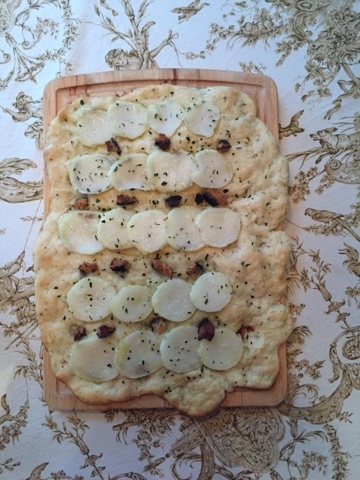 It's from Beca in season 2; she baked this focaccia in the quarterfinals. I've made focaccia many times, but this recipe definitely beats anything I've made before. It's not the toppings that blew my mind, but Beca's recipe calls for adding mashed potatoes into the dough. Now thats a game changer! Fluffy mashed potatoes baked into a thin layer of dough, amazing! Bravo Beca! The original recipe called for Maria Piper potatoes, didn't have those, so I used Russet potatoes. Also, to top the focaccia, the recipe called for 15-20 baby new potatoes, didn't have those on hand either, so again I used the Russet. The cheese used in the original recipe was Gorgonzola, I used Miyokos Mt. Vesuvius Black Ash Cheese. I thought the flavor of the Black Ash would be similar to Gorgonzola. I dotted the top of the focaccia with the cheese. I was hoping the cheese would melt, but as you can see from the picture, it didn't. I recommend if you use this cheese to spread in on the focaccia first then layer the potato slices on top. Boil the potatoes in a large pot until tender. When potatoes are finished boiling, ladle out 4fl oz of the liquid and set-aside. Remove the tender potatoes with a slotted spoon and place into a small bowl. Keep the water boiling and add the 3 whole potatoes (or 15-20 new baby potatoes) to the water. Boil until tender, drain, and set-aside. In a large bowl, mix the yeast, sea salt, and rosemary. Mash the cubed potatoes with olive oil, add to the flour mixture, and mix well. Now add the reserved potato water gradually; stir until the mixture forms a dough. Place dough onto a clean surface, use a little olive oil to help knead the dough. Knead until the dough feels smooth. Place in a lightly oiled bowl, cover and let rise for 1 hour. While the dough is rising, place the whole potatoes that you set aside earlier, onto a cutting board. Slice each potato into thin rounds. Place the dough onto the baking sheet, gently spread the dough using your fingers to fit the sheet. Drizzle some olive oil over the entire surface of the dough; sprinkle with Rosemary. Layer the slice potatoes and dot with the cheese. Bake for 25-30 minutes. Slice with a pizza cutter or sharp knife and enjoy! This is the Number 2 recipe in my attempt at veganizing The Great British Baking Show's technical challenge recipes. This Pretzel challenge was in season 2 and another easy transformation to vegan. The only switch outs I did was to vegan butter, and almond milk. To be honest, I was more concerned with forming the dough into the traditional pretzel shape. Which, by the way, I was able to do; how I did, I am still puzzled at though, and I still couldn't explain the steps to someone. The Great British Baking Show gives you 2 variations in how to accomplish the twist. I am sure I did one of them! The recipe called for poppy seeds, sesame seeds, and a orange glaze. I skipped all that and just made plain salted pretzels. If you want to use alternative topping, please do. In the bowl of a stand mixer and using the dough hook, combine the flour, sea salt, yeast, and vegan butter. 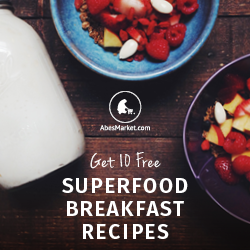 In a small bowl, whisk together the malt extract (or molasses) and the almond milk. Gradually add the milk mixture to the flour mixture. Mix on medium speed until a stiff dough forms. Remove dough and place on a clean surface. Knead for 10 minutes; the dough should not be sticky, so flour should not be needed to knead. The dough should be smooth and glossy when you are finished kneading. Place dough in a oiled bowl and cover, let rise until doubled in size, about 45 minutes. In a large stock pot, bring to a boil 12 1/2 pints of water. When water starts to boil, add the baking soda. In the meantime, divide dough into 6-7 equal sized balls. Using your hands, take each piece and roll into a 16-20 inch long rope. Now to shape, this is the traditional and quickest way to shape a pretzel. Hold each end of the rope, lift it into the air to create a U. In one swift movement, flip the center of the U, propelling it to form a double twist. Lay it back onto the lined baking sheet, lightly press the ends of the rope into the opposite side of the pretzel, towards the center bulge. Repeat with remaining dough balls. Gently place the pretzel into the boiling water for approximately 5 seconds. Remove and place back onto the lined baking sheet, continue with remaining pretzels. While the pretzels are still wet, sprinkle with your choice of toppings. Using a sharp knife, make a deep slash into the thickest part of the dough. Bake for 20-25 minutes. 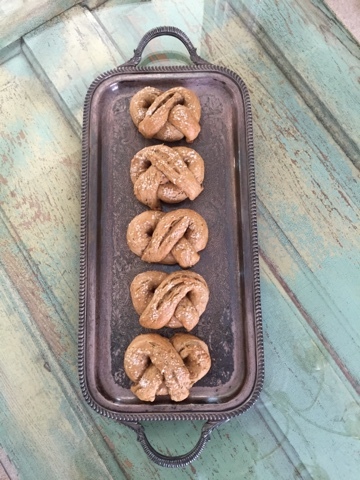 Place baked pretzels on a cooling rack and let cool completely before devouring! I have been reading about vegan ultra-runner Scott Jurek's record breaking Appalachian Trail thru-hike of some 46 days. I found it quite interesting that one of his go to foods on the trail was miso rice balls. Although I am no ultra-runner, I just had to try making some of my own.. Prepare the rice per the instructions, I recommend a rice cooker for best results. Let the rice cool a bit bit, closer to room temperature. Dip your fingers in the saltwater to keep the rice from sticking. 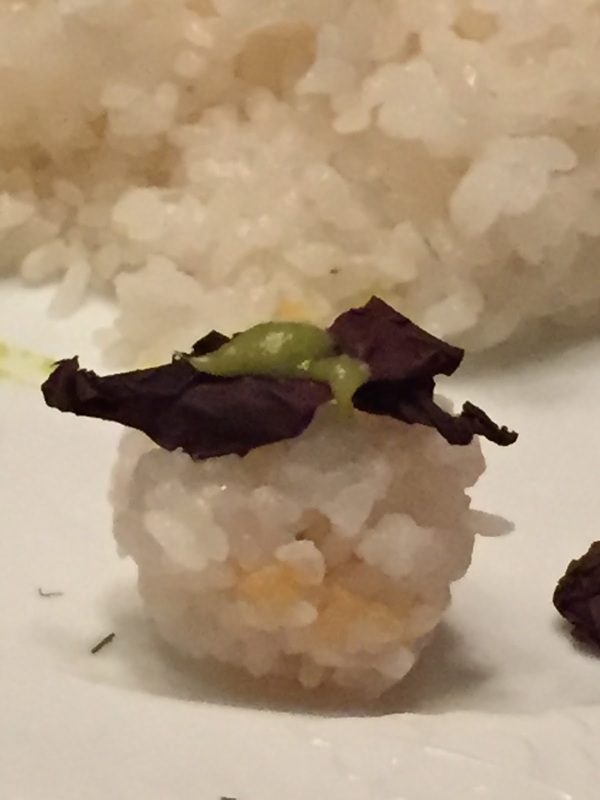 Start with about a teaspoon of miso paste, form a golf ball sized rice ball around the miso. Top with some dulce and a touch of wasabi. Now is an opportunity for some creativity, I also added some diced daicon to the inside of the rice ball and pickled veggies work great here as well! Get creative with toppers too; try soy sauce, teriyaki or some sriracha sauce. Hope you enjoy these rice balls as much as my daughter and I did. Written by guest blogger Jeff. I've had this idea for a few months now. Veganizing the recipes from The Great British Baking Show. I love this program! The bakers are all so sweet, even though they each want to win they encourage and cheer on their fellow bakers. Very refreshing I'd say! While I watch the bakers race to bake their scrummy treats, my mind is in a whirl as I try to revamp the recipes by making them vegan. I've given myself the task to make each techinal challenge recipe vegan. Now, some look easy, while others will take a little work, but I am excited to try. My first conversion are the Tea Time Scones. This was an easy one, the only thing that was a little difficult was I had to weigh out all the ingredients. No scooping up flour and sugar into a measuring cup here. Bring out your kitchen scales if you have them, cause you'll need them. For the caster sugar, I used regular cane sugar but ground it up a little in my food processor. The egg replacement I used was the neat egg. This was my first time using this product, I think it worked out well. I usually use a flax egg which is more loose, Neat Egg is very thick. The original recipe says to brush the top of the scones with the "egg" and milk mixture, I brushed my scones with melted vegan butter. This recipe is pretty straight forward, making it vegan, like I said before, was easy. Onto the next! The original recipe doesn't call for organic ingredients, but that's what I always use. Pre-heat oven to 425 degrees. Line a large baking sheet with unbleached parchment paper, set-aside. In a large bowl, mix together the flour, and baking powder. Add butter and rub it into the flour mixture with your fingertips until the mixture resembles fine breadcrumbs. Stir in sugar. Prepare your vegan egg; if using the neat egg, place 1 tablespoon of the neat mixture into a small bowl with 2 tablespoons of water. Mix thoroughly and add to the flour mixture along with the almond milk. Stir until a dough forms, if your mixture is too dry, add 1 tablespoon of almond milk as needed. Dough should be slightly sticky. Place dough onto a slightly floured surface, pat out dough until it's about 3/4 inch thick. 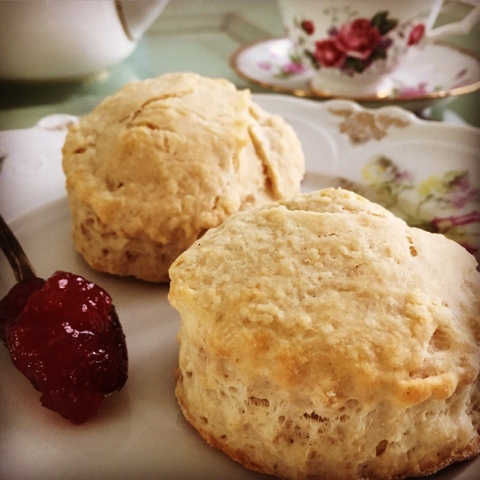 Use a 1 1/2 inch fluted biscuit cutter to stamp out scones. Don't twist the cutter or the scones will not rise evenly. Place scones onto the lined baking sheet and brush each scone with the melted vegan butter. Bake 8-10 minutes, or until golden brown. Transfer to a wire rack to cool, before enjoying!